If you have some members on your team who are allergic to latex or the chemicals found in nitrile gloves, finding disposable gloves can become a difficult task. 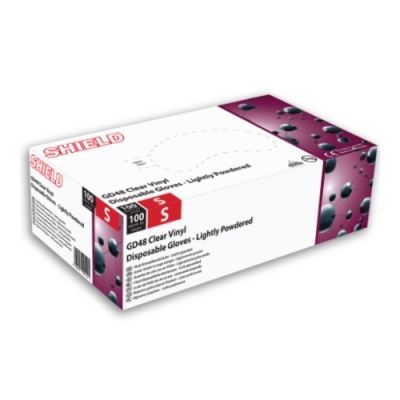 The Shield GD48 Lightly Powdered Vinyl Disposable Gloves (Pack of 100) are made from PVC plastisol. This reduces the likelihood that your team will suffer from allergic reactions or hypersensitivity. This tests the gloves to ensure they protect you against liquid penetration and micro-organisms. These particular Vinyl Disposable Gloves received an AQL rating of 1.5, meaning they obtained a performance level one in this area. The Vinyl Disposable Gloves have been tested to this set of standards to ensure they're suitable for single-use medical purposes. The results are shown in the table below. The Shield GD48 Disposable Gloves are available in four sizes. To find the correct size, please measure your hand across the widest part of your palm and refer to the sizing table below.